Every homeowner wants the best for their home. The stereotype is that the best materials must always be the most expensive ones. This is not always the case. Decorative concrete aims to prove that wrong. It offers a wide range of options that provide hotel-quality designs, colors, and features at a friendlier cost. There is a suitable solution for different concrete issues and for different surfaces inside and outside a house. Residential floors come to a point where it looks dull, damaged, and old. Although every stain, dent, or crack has a corresponding memory that the owner probably experienced, it is not a pretty sight and it can be a safety hazard. Homeowners would be glad to know that there are decorative coatings and overlays that can make their home sweet home a lot sweeter. Walkways and Front Entryways – Often on the frontline of most homes, these surfaces could definitely benefit from a stamped brick or stone overlay. Driveways – A hugely influential factor in a home’s curb appeal, a concrete driveway definitely deserves to look and function well. A stamped overlay or spray texture can provide great aesthetics, improved traction, and durability against outdoor weather, traffic, and freeze-thaw cycles. Patios – An outdoor living space would look great with a stamped surface, a spray-down texture, or a stained slab. They make the patio look better and easier to maintain. Pool Decks – Spray knockdown finish is highly recommended for pool decks because it features a slip-resistant texture and it is able to maintain a cool temperature, making it easy to walk barefoot on. Interior Floors – Concrete stains can definitely turn any indoor flooring into a luxurious surface that will make you forget about carpet, tile, hardwood, or any other flooring materials. Garage Flooring – Garage floors go through so much and a coating of epoxy or polyurea polyaspartic can protect the slabs, creating a more durable and damage-resistant surface. Do you have a residential floor that needs a new look and better function? Call (773) 377-8976 to know your options. 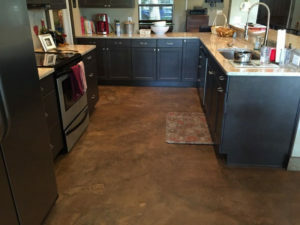 Chicago Concrete Resurfacing is a leading decorative concrete company that provides resurfacing, refinishing, and repair solutions for residential and commercial properties in Chicago, IL. Our highly trained team has dealt with various concrete surfaces, breathing new life into it, making sure that every detail is addressed. Have a residential epoxy flooring project? We’re ready for you. Pick up your phone, call us, and we’ll schedule a free in-home visit for you in your most convenient time.